Isn't he or she cute? I wish I could give the photographer credit, but in the mean while I'll just say "who ever you are, thanks for this great picture!" Edit: Ah, now I can! Picture taken by: Photograph by Karen (jumbokedama on Flickr) Many thanks to Susan Berger for sending me the info. So I decided I would like to do the huck lace diamonds again as I found it to be a fun weave, its also easy on the joints and the pattern is visually very satisfying to weave. Well, yarns dyed black have had a harder time of it from all other colours. It takes a longer process with higher percentage dye and then there's the mordants and all the rinsing. It didn't surprise me that this linen was a bit more 'linty' than the others and I even considered wearing a mask to weave. I knew the vacuum would have to come out at the end of the project and maybe even mid way! Not much better huh? You can just make out the basic design shape but not much clarity, leastwise there could be two mistakes right there and you'd never see them! Oh, crap! Now what? So that's what I did for a whole runner, then a second in all black linen. The third runner I ran into a completely different problem. I ran out of black weft! I decided to stick with linen and used a natural beige 9/2 linen and feature all black hems. An even beat is essential as variations will show as streaks. It was much easier as I could see the pattern build and grow and by now, a good steady rhythm was achievable. I found no difficulties in beaming the warp but I had help beaming to ensure even tension. It makes a real difference. I laced on over hand tying bow knots. Linen can be slippery and this also leads to uneven tension. I used an end delivery shuttle with adjusted tension to give me lovely edges. I wound my pirns *very* tightly using my AVL winder, with a tensioning device. I used a damp clean cloth to hold the tail of the yarn from the cone in my hand as I wound on. This dampness seems to help tame the linen, and reduce the fuzzies. Its not wet, simply damp. If you do one pirn or bobbin using this method, you must do them all as it will show in the cloth where you didn't. Linen is nifty when it comes to turning hems.... they tend to fold over nicely and press flat well. Basically the whole project is stiff ! The linen becomes softer with laundering and even gets better over time with each further wash and press. Linen must be hemmed as fringes will disintegrate with washing. Its also the perfect fibre for playing with special hemstitching techniques or even leno borders, and Danish medallions. Last of all... don't be intimidated by linen. If starting new to linen, then use a plied linen (not a singles) and have fun with it! 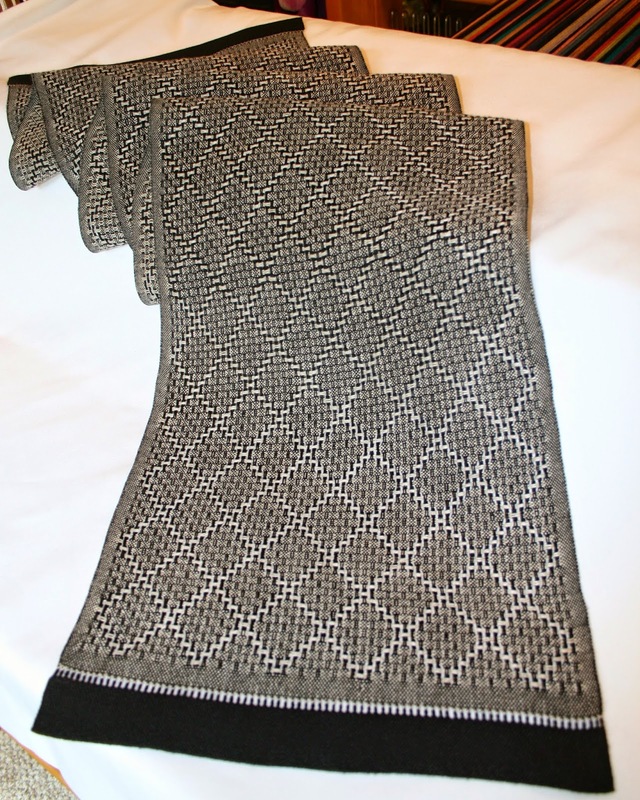 My first linen project was four napkins using 16/2 and table napkins draft from a Handwoven Design Collection issue. I even crocheted a lacy shell edging all around the four napkins and they sold at the guild's Christmas sale. It was my first time for huck lace too and I wove them on a table loom. The lace areas all shifted to their final positions with the hand washing. I got two all black runners 13 inches wide and one is 57 inches long and another is 61 inches. 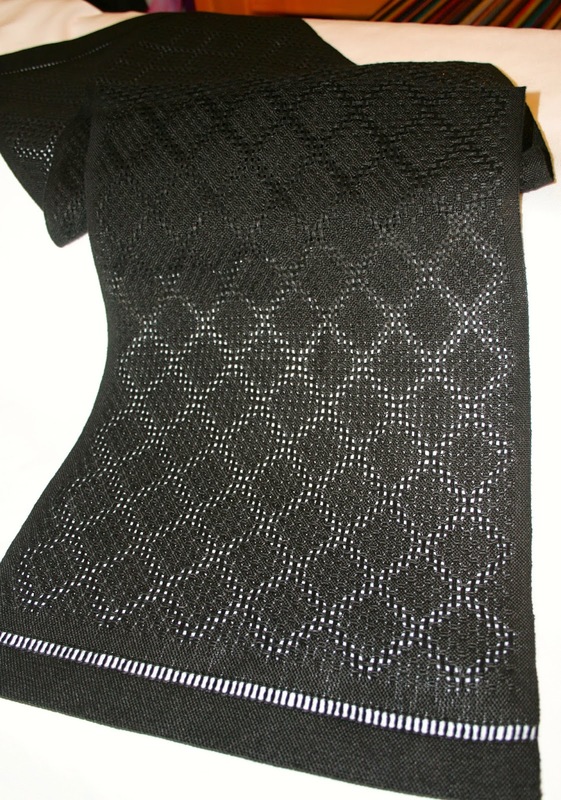 A neat feature of the solid colour lace is the effect of seeing Celtic knot work like curves when its turned to produce squares over the diamonds. It only works with solid colours though. 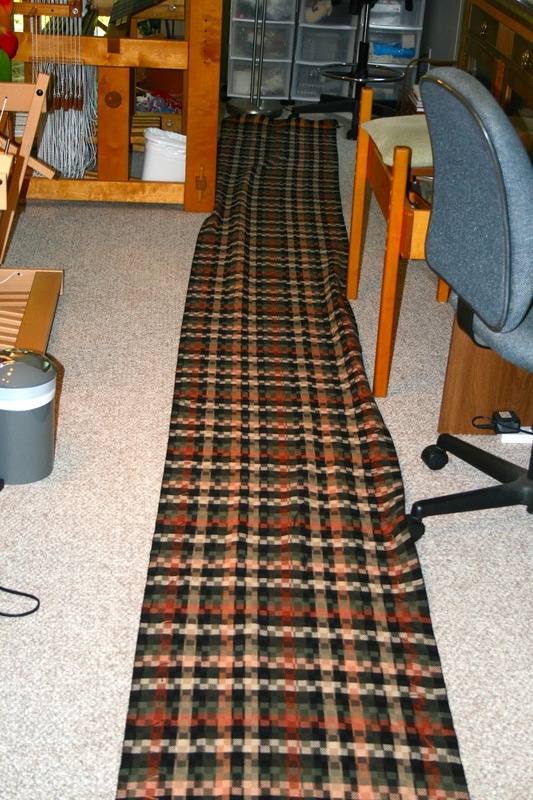 This runner comes in at 71 inches over all length, by 13 inches wide. The beat appears to be even thankfully! It has that look of quiet elegance I wanted to achieve. Oh, by the way... there was not one treadling error in all three runners! So it seems that I have my hanging basket back and just in the nick of time. Ice cubes squirrelled into the available pockets around the junco nest was just not enough water for the basket... and it really needed a good fertilizing too. The babies literally stood on the edge and jumped, and they were last seen part hopping, part flying around the other flower beds with frantic parents trying to keep up. Seems to me, that this scenario can often mirror our experiences with our own children! 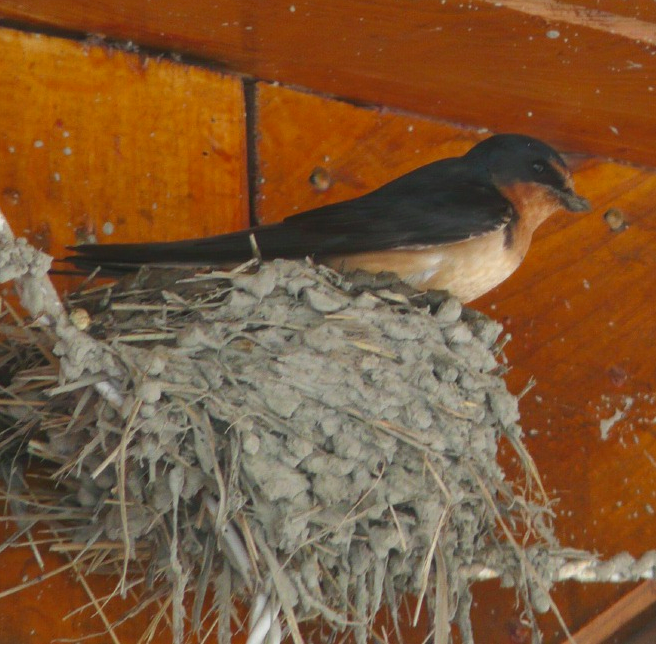 While the flower basket enjoyed a good watering and feeding, Bruce announced that we can't park our car inside the carport as swallows have built a nest in there and they are pooping everywhere! So now our 'new' car is out in the driveway and the birds have full ownership of the carport. The compost cone has been emptied and dismantled and moved away. Seems it had become an all you can eat salad bar for rodents! Not good.... so we have evicted them. Being here in the trees, we can't feed the birds as it brings in bears and we can't put up humming bird feeders as it attracts ants. 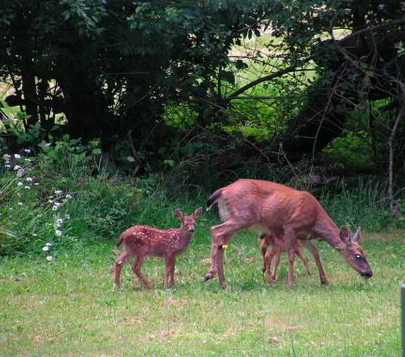 Then there are the little island deer (which look like baby deer but jump 5-6 feet with no problems) who eat annuals and hedges. Having said all this, we do love being in a private setting with nature all around.... even if does push into our space from time to time! My towels on the loom measured twenty five inches in the reed, With draw in and then laundering that reduced to twenty two inches. Twills will tighten up and draw in happens, and then there is the shrinkage factor too! I know that I want large towels and will turn small hems but how long should they be in proportion to the width? What is a good length to allow for small hems on either end and a generous body of cloth? The Greeks believed there to be three "ingredients" to beauty: symmetry, proportion, and harmony. This triad of principles infused their life. They were very much attuned to beauty as an object of love and as something that was to be imitated and reproduced in their lives, architecture, education (paideia), and politics. They judged life by this mentality. Okay, for some folks this is super fascinating stuff... and for others, their eyes glaze over! I failed math in school and the advent of calculators arrived too late to save my grades. Not that the teachers would have let me use it in class like they do now! All you need to know is that there is a mathematical formula to achieving a pleasing balance between width and length. You have to love the internet as now you can simply click on a link and plug in the known number or measurement and get the golden ratio calculated quickly and painlessly for you! You enter in the known number at the web site by changing the orientation from portrait or landscape if necessary and the calculator will provide you with the correct number. In my case I entered twenty two inches and the calculator gave me thirty and a half inches for my finished length. Then I had to make a decision on what to allow for hems and cut each towel apart every thirty four inches. I measured every thirty four inches and placed a little red cotton loop to mark the cutting line. 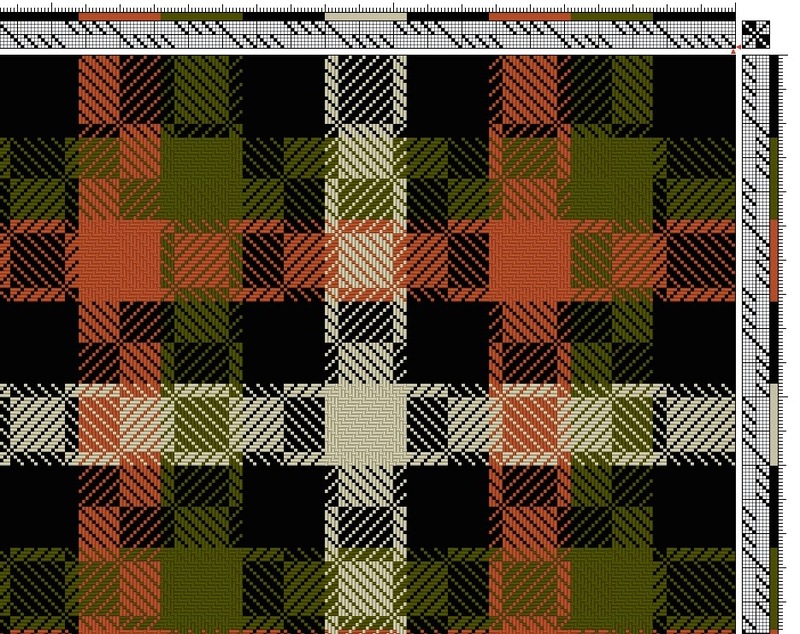 Fortunately the pattern has built in lines to follow! I found only one treadling error in all of the 8.6 yards! As you can see I marked it with a green loop and it coincided right next to a cutting line. It would be buried inside the hem allowance. A great bit of luck! I folded the edges and pressed and pinned them and they were to be a task to do at night while we watch the television. Great in theory but with black thread, and all black sections in warp and weft it has become a day time job so I can see what I'm doing! I have to make a comment about the colours. They are black, a sage green, cream beige, soft peach and something I like to call "burnt pumpkin" Its not the orange I see on my computer screen but something much softer and lighter. Trust me, they all work together nicely. Meanwhile my next warp on the loom is a bit difficult to weave because I can't see what I'm doing! I'm having to treadle by my notes alone and be extra careful to call out the steps so I don't miss one. I can't see to correct a mistake.... and later after its off loom and washed won't be much help! If you click on the picture and look carefully, you can just see a bird sitting on the top of the farther wrought iron flower basket supports. That's Daddy Junco on guard duty. 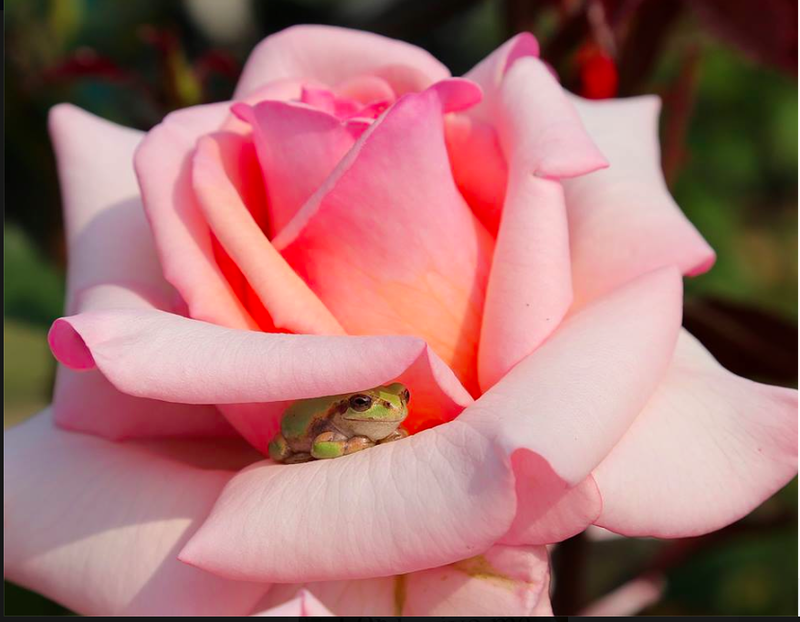 He and his mate have built a nest in the flower basket. When ever we use the front door, they sit in the magnolia and chirp away at us in little warning calls. Holding the camera up very high, I quickly snapped this picture. There are at least two babies here and a possible third. Their little feathers are coming in nicely. With some luck, I can get these wee fellas fledged, and save my flower basket! Here I am at the very end! The gold scrap yarn was the absolute limit of my being able to get a shed and not have skips. I want to see how much loom waste this Louet Spring really has. ....but I was right up to the back of the eighth shaft heddles in the back! I decided to nip the warp ends right at the metal apron bar. The idea is to measure the length at back and then see what I have left at the front for my total. I'll give those totals in my next post. The roll got quite full. Very satisfying pulling it all off and having a huge armful of fabric! So we stretched it out...and it ran the full length of the studio which is twenty six feet long! So that's 8.6 yards. I think I'm going to sew / serge the ends together and pre wash it before cutting it apart this time. I will steam press it ahead of cutting and hemming. 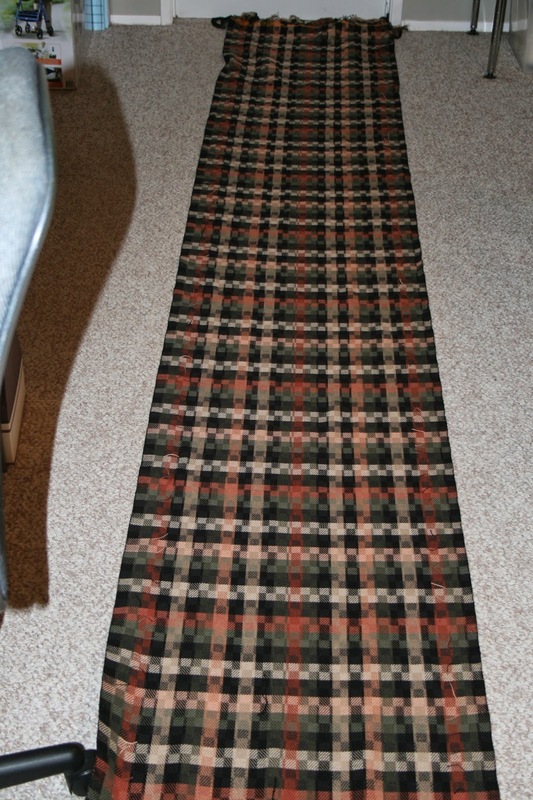 I think this is the longest plaid I have ever woven! The poor loom looks gutted! Bruce helped me pull the warp off and we both likened it to giving birth! Its takes time to tighten everthing back up again. Two hours later, I'm slipping the next new warp into the raddle slots. I'm going to revisit a recent project a time or two. Table runners are up next.